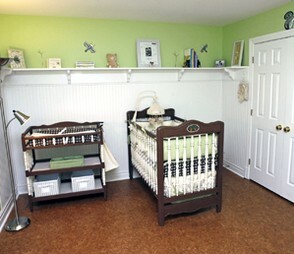 There are a few things you will want to consider when deciding on your baby nursery flooring. You'll want a flooring that is easy to clean and maintain. Your little one will soon be making all sorts of messes and the easier to clean the better. If allergies are a concern, you'll want to consider flooring that is easy to keep dusted. A few like cork are hypoallergenic and maybe a good choice for you. A softer floor will be appreciated by you and your little one when you find yourselves rolling and crawling around on the floor. Floor time for both of you will become a big part of your baby's development. It's also easier on them with all those falls they will have as they become more mobile. Solid surface floors can range from vinyl and linoleums to hardwoods. These types of floors are easy to clean and keep the dust down. This may be a very important feature for you baby nursery flooring. Vinyls and linoleums are a little softer and come in all sorts of colors and patterns. 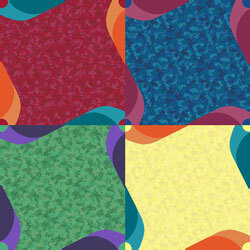 They can really add a lot of fun to your room by using several colors or designing fun patterns for your floor. Hardwoods can be beautiful in any room. If your floors need refinishing, have them done before doing anything else in the room. You can even paint old wood floors, if you are not interested in having them refinished. They can be multicolored, patterns, with paths to various areas of the room, or a path leading to a garden mural on the wall. Hardwood floors can be your traditional oaks and maples or something more exotic like bamboo or cork. For those moms who are eco-friendly, you'll be glad to know that bamboo and cork are green products. Imagine a nursery rhyme theme that has monkeys or bears or other animals with a beautiful bamboo floor. How perfect! Cork is one of my favorite floor finishes. Cork comes in all sorts of colors and patterns, they are not just the typical bulletin board corks. Cork also is a hypoallergenic, soft floor for a solid surface. It has a bit of a 'cush' to it that makes it easier on little heads. It's even easier on your feet for those middle of the night walks settling your little one. One other neat feature about cork floors is that they retain the same temperature as the room. So no cold floors under those little bare feet, knees and hands. 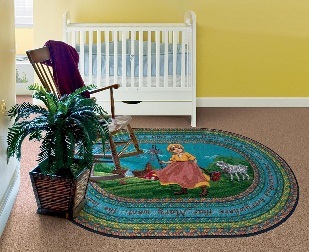 So you may find the versatile and warm features of cork are just perfect for your baby nursery flooring selection. Carpets and rugs are definitely a softer floor for a baby room. If you prefer a warm soft carpeted floor, there is a wide range of carpets to choose from. 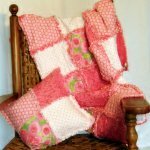 Be sure to pick a color or pattern that easily works with your theme. There are even carpet tiles, which I think are great for a nursery. You can get the softness of carpet with the versatility of tiles. There are hundreds of colors, styles and patterns in carpet tiles. 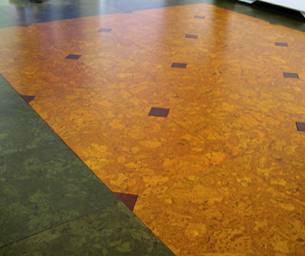 These adhere to your floors and can be laid out in any pattern that you desire. You can create various areas in one room. These tiles can be used to create wall to wall carpeting or an area rug. Any tiles that are heavily soiled or damaged can easily be replaced without having to replace the entire floor. As your little one grows, you can even move the tiles around to create a totally different look as your room grows from needing baby nursery flooring to a toddler styled room. Rugs are an easy way to soften up a solid surface floor. They come in lots of sizes, materials, colors, patterns for a relatively low cost. You can select several small rugs to cushion areas where you'll be doing lots of standing, such as by the crib and the changing table. Or you can do one large rug in the center of the room. Either way you can find an incredible array of rugs to incorporate in your nursery rhyme theme. Bedding- That all important crib bedding helps pull the whole room together! Ceilings - Ceilings make a fantastic fifth wall! Colors - Colors for a nursery run from pastels to jeweltones to brights! Furniture - Nursery furniture is the backbone to your baby's room. Lighting - Lighting is an important aspect to your nursery design. Wall Finishes - Walls that show off your nursery rhyme theme!